BizBash posted an article earlier this week that explores “What’s New in Spousal Programs at Meetings and Conferences.” The premise of the article is that the best offerings go beyond the standard lunches or spa days, and instead are unique to the city, gender-neutral and have a lasting impact on the attendee. First, for those that like those traditional offerings and see a spouse’s business trip as a chance to treat yo’ self (in the wise words of Parks and Recreation’s Donna Meagle and Tom Haverford), that’s ok! Columbus still has you covered. Ladies, blend your own custom lip color at Mukha Spa, then relax with a mani/pedi from W Nail Bar and a blowout from The Blowout Bar. Gents, gather the troops for a straight-razor shave or beard trim offered with a side of darts, pool and a drink from Royal Rhino Club. Stay on-trend with the hottest new spa offerings by visiting Tranquility Salt Cave or True REST Float Spa. Fashionistas can set up a session with Wardrobe Therapy for a closet consultation, have a farm-to-fashion experience with Celeste Malvar-Stewart or get fitted for a custom suit at Pursuit. Now, for anyone looking to do a little something more, make something to take home or learn something new, there are plenty of options for that too! Explore the city on a Segway or bike, or get a taste of all it has to offer with a Columbus Food Adventure or Columbus Brew Adventure tour. Try your hand at glass blowing with a class at Glass Axis, or head to Flowers & Bread and see how well you can make donuts, jams or even a lush floral necklace. Check out the Billy Ireland Cartoon Library & Museum, which houses the world’s largest collection of materials related to cartoons and comics, and learn about its annual Cartoon Crossroads Festival and what that means to the industry. Bringing the whole family? That’s even better! 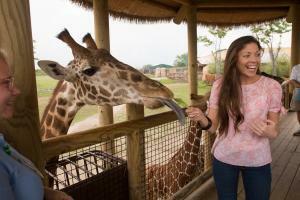 Feed a giraffe at the Columbus Zoo and Aquarium, play in the 2-acre Scotts Miracle-Gro Foundation Children’s Garden at Franklin Park Conservatory & Botanical Gardens (opening May 2018) or get up-close-and-personal with life-size dinosaurs in the American Museum of Natural History Dinosaur Gallery at COSI. Columbus is also the only place you can pay homage and learn the stories of our veterans, their families and the Fallen across all branches of service and all eras of conflict in one place, at the National Veterans Memorial & Museum, opening in 2018. The opportunities are endless in Columbus. Contact our team of experts today for recommendations and help putting together your meeting’s next spousal program.